Lok Sabha Elections 2019: The Pathanamthitta constituency consists of assembly seats from Pathanamthitta and Kottayam district. 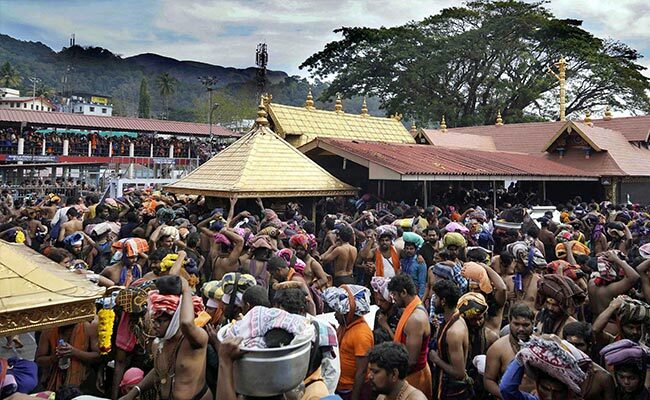 The traditionally bipolar election to the Pathanamthitta Lok Sabha constituency, ground zero of the Sabarimala agitation, has gone triangular this time with the BJP hoping to win over voters who are opposed to implementation of the Supreme Court order on entry of women in the hill shrine. The BJP has fielded its state General Secretary K Surendran, who led the Sabarimala protests against changing temple traditions, while the ruling Left Democratic Front has nominated Veena George, its Aranmula assembly lawmaker, to take on two-time Congress-led UDF Lok Sabha lawmaker Anto Antony. The opposition to the Left government's decision to implement the September 28 Supreme Court order on allowing entry of women of all ages in the shrine of Lord Ayyappa snowballed into a huge agitation that grabbed national headlines. The protests, one of the most violent religious agitations in Kerala, was led by a section of devotees, right wing outfits and the BJP-RSS. During the protests, Mr Surendran was arrested and jailed on various charges, including attempt to murder and the use of criminal force to outrage the modesty of a woman. The constituency consists of assembly seats from Pathanamthitta and Kottayam district. UDF's Antony, who won from the constituency in 2014 and 2009, is leaving no stone unturned to continue his winning streak. He won 41 per cent of votes in the 2014 election and had a winning margin of 56,191 votes. "He is banking on his developmental credentials. He had done so much for the constituency," said a local leader who is assisting Antony in the campaign. However, both Ms George and Mr Surendran are also confident of putting up a good fight to wrest the seat from the UDF. Mr Surendran has been busy visiting families and meeting prominent personalities in the constituency. "We need to bring back Modi government. It's only the BJP that can promote Sabarimala as a world famous pilgrim centre. When Sabarimala develops, the Pathanamthitta district and constituency develops," he said. He alleged that no other political party was interested in developing the shrine. LDF candidate and former journalist Veena George expressed satisfaction over the response of the people during the campaign. "LDF would register historic victory in the coming Lok Sabha polls. The number of participants in our poll campaign itself is a proof for the immense acceptance of the party," she said. Ms George said she will take up with the Centre the issues of Erumely airport and rejuvenation of Pamba river. Pathanamthitta is considered one of the best districts in the country with high human development indices matching most of the developed countries. The district boasts of the cleanest air in India as per a World Health Organisation (WHO) report. It is also one of the least poverty affected districts in the country with a literacy rate of 96.55 per cent. Out of the total population, 56.93 per cent belongs to Hindu community where as 38.12 per cent are from Christian community. The church is an influential body and has been a key player in every field of development including infrastructure for schools, colleges and hospitals. The Nair Service Society (NSS), which is a body representing the powerful Nair community and has been in the forefront of the Sabarimala protests, in a circular Tuesday made it clear that it will continue to maintain equi-distance towards all the three fronts. This would be music to the ears of the ruling Left as the NSS had been upset with the government over the handling of the Sabarimala issue, and the UDF and the BJP were hoping to woo Nair voters. Prime Minister Narendra Modi had attacked the Left government over the Sabarimala issue, saying it was trying to disrespect Kerala's culture. The LDF government, which had incurred the wrath of a section of Hindu community by deciding to implement the top court verdict on Sabarimala, had set apart Rs 739 crore for overall development of the temple town in its budget and another Rs 100 crore to the Travancore Devaswom Board (TDB), which administers the Ayyappa shrine. Jayalekshmi, an expert in ecology and environment and a staunch supporter of the Left movement in Kerala, said the political parties were exploiting the sentiments of the devotees. "The ruling LDF could have shown some restraint in implementing the Supreme Court verdict. The BJP had used the situation. However, the matter is going to be a decisive one in this election," she said. The Pandalam royal family, associated with the Sabarimala temple and the agitation, had earlier told the media that they will not campaign for the BJP in the polls. As per the 2011 census, Pathanamthitta has a population of 1,197,412, of which male and female strength was 561,716 and 635,696 respectively. It was also a district which showed a negative growth in population, -2.97 per cent, as per 2001 census. Carved out of neighbouring Kollam, Idukki and Alappuzha districts in 1982, the district has two international airports within a distance of 100 km.